View a Quicktime clip with motion control work samples and making of scenes. Setup time on Location: about. 30-45min. 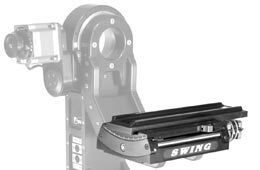 For macro shots the dolly can also be equipped with linear ball bearing guides. The Speedrail is extremly lightweight and portable and therefore capable of high dynamic moves. Caused by the reduced weight the Speedrail can be easily transported with airfreight. The Speedrail is fast enough to be used for moving highspeed shots, even up to 1000fps. System with drivers for 9 axes (optionally up to 24), mostly used with MC-4. Moves can be programmed as keyframes or real time teach-in. An uninterruptible power supply prevents loss of data during operation. 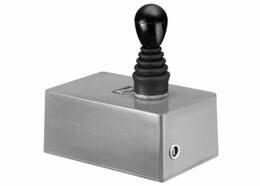 Trackballs allow direct simultaneous control of up to 6 axes for fast programming. Use of virtual axis allows an easy data exchange with CA (x,y,z in cm for translations, angles in degrees for pan, tilt and roll). 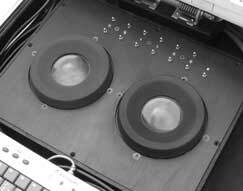 System with drivers for 5 axes. 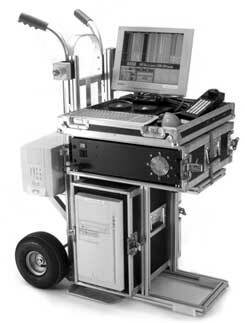 This mobile unit is mostly used with the Speedrail or MoCo-dolly. Moves can be programmed as keyframes or as a real time teach-in. Easy data exchange with CA (track in cm, angles in degrees for pan, tilt and roll). Can be used standing (high mode) or hanging (low mode). An integrated dovetail allows extremely low camera positions. 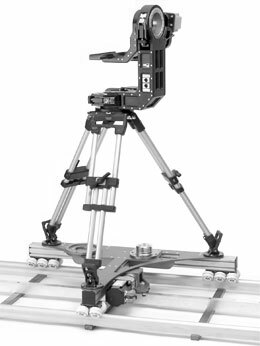 Can be used with MC-4, Speedrail, MC-dolly or tripod. By sliding the camera back and forth, lenses can be set up into nodal position. If using 90°-periscopes a low mode L-head is recommended. 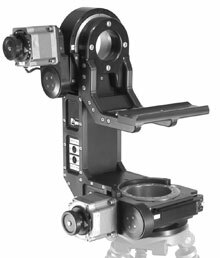 The electronic nodal compansation makes is possible to pan and tilt around lens nodal. 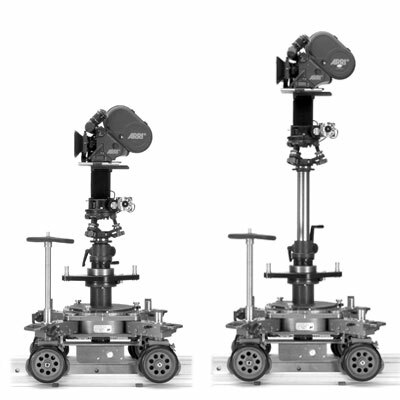 Optional unit for rolling camera movements and dutched camera angles up to +/-45°. 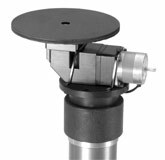 With this unit the L-Head is turned into a 3-axis head. 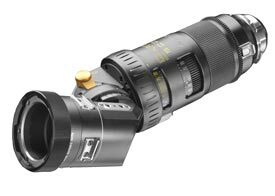 This head is extremly small and especially designed for the ARRI 235 camera. 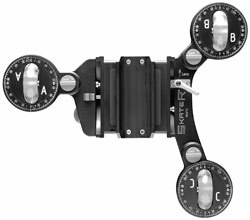 The camera is side mounted and is full compatible with the 235 side-rod system, mattebox and follow focus. Capable of extremly low lens positions. Can be used standing (high mode) or hanging (low mode). 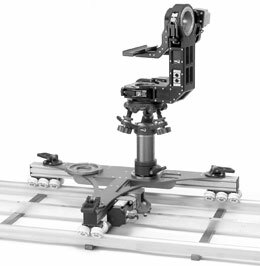 Works with MC-4, Speedrail, MC-dolly or tripod (standart Mitchell base). 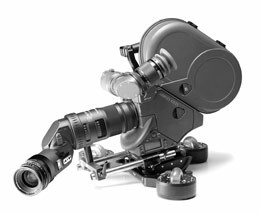 Together with the SKATER Scope the Angled Head allows to film from the side if a setup is diffcult to reach. With nodal compensation tilt and pan camera moves can executed around the lens. 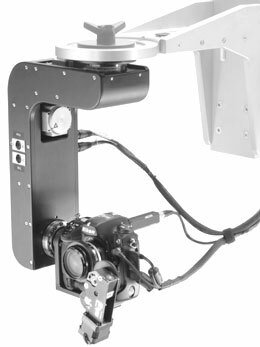 With the optical rotation of the SKATER Scope this setup is a true 3-axis camera head. Recording of sequences with high resolution still camera (Nikon D2H). 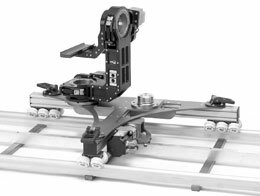 Ideal for packshots, miniatures, demo sequences, product shots, time lapse motion control, single frame animation. 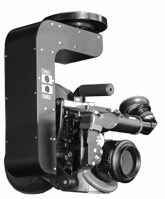 Color video assist for real time programming of moves. Full control on camera, like exposure, focus, power supply, interval etc. through motion control unit. Space saving mini camera head. Film sequences can be recorded with a high resolution of far more than 2K (up to 4K possible), color depth 8bit oder 16bit RAW. Speed can vary from extreme time lapse up to 3 fps. Immediate control of the final take, cost saving, no lab, no telecine, good integration in work flow with CA. 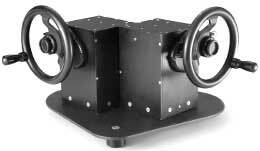 Allows control and real time teach-in of pan and tilt. Can be used with both control units. The 1st AC can use the focus control for keyframing which is similar to other remote controls. The focus can also be recorded as a real time teach-in. Uses standard ARRI focus rings. 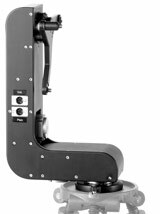 The Joystick allows to record dolly movements or other axis which are immidiatelly available for playback. 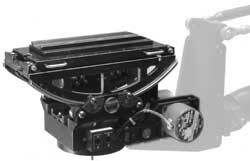 Turntable with diameter of 20cm, only with control unit. 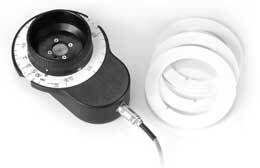 For discs with diameters up to 100cm, only with control unit. 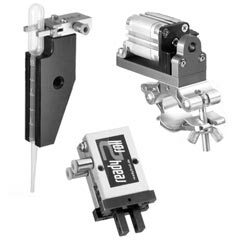 The Triggerbox allows to release catapults, claws, pneumatic effects, magnets, light effects, explosions etc. with an accuracy of a fraction of a single frame. 2 Units with 8 channels each are available. Ready2Roll owns a large number of rigs, like catapults, claws, release mechanisms, pneumatic cylinders, drop releaser, air nozzles etc. 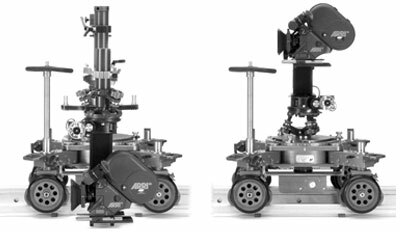 which can be used together with the Triggerbox to be frame accurate syncronized to a camera move or other effects. The possibility of using preprogrammed sequences of various effects or moves is crucial for a wide range of high end high speed photography shoots. The SKATER SCOPE is the first compact lens snorkel system! Due to the small design and a great variety for individual adjustments it is an ideal snorkel system for motion control applications. Back focus extends close focus to macro. 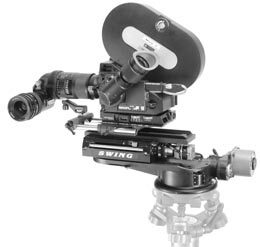 Allows linear camera tracks, as well as all sorts of circular and curved movements with an extremely low lens height. Shots that would normally require complex rigging or even motion control can now be executed with almost no prep time. Ideal for tabletop photography and product shots. 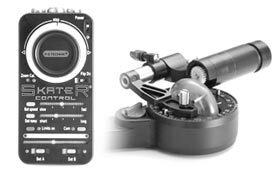 The SKATER Control is a programmable single axis remote control unit to perform precise tracks on the SKATER Mini Camera Dolly. Speed, ramps, start and end points can be preprogrammed and stored (not suitable for multiple exposures). The intuitive control can be learned within minutes. The SKATER Control can also be used to perform a programmed image rotation on the SKATER Scope or to control a SKATER Turntable.